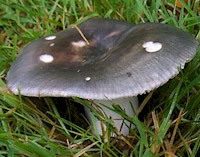 The family Russulaceae contains two genera: Lactarius and Russula. In Europe there are some 160 species in each of these genera: reasonably manageable, you might think... but actually this family - and the genus Russula in particular - is one of the most challenging when you want to identify mushrooms to species level. The two groups differ mainly in that Lactarius fungi produce a milky latex from their gills when damaged whereas Russula species do not. Both genera are characterised by brittle flesh and pale spores. Russula (the brittlegills) and Lactarius (the milkcaps) are different from most other mushroom genera because rather than comprising only tube-like hyphal cells they contain lots of spherical cells called sphaerocysts; this makes their texture less pliable and more fragile than other mushrooms. Brittlegills are fleshy fungi. Most of them are edible, although many species are too hot and acrid for most people's taste, and some - Russula nobilis for example - cause stomach upsets. In general the mild-tasting ones (in Britain and mainland northern Europe, at least) are all edible, although not all could be called delicious. The Russula genus contains mushrooms of many colours, from white, yellow, tan and brown, through pink, orange red and purple to blue, mauve and even green. All brittlegills are ectomycorrhizal with trees or shrubs, and so they occur only in woodland settings or with shrubby plants (including, in some instances, heathers and other heathland species). The species illustrated here is Russula parazurea; its cap colours are somewhat variable, which is a frustrating characteristic of many of the brittlegill mushrooms, so that for most species onfident identification requires macroscopic inspection, and sometimes also chemical tests. Gills are attached to the stem; note the gill spacing, the presence or absence of short intermediate gills (lamellulae) near the cap margin, and whether any of the gills are forked. Spore prints are range from white and cream through pale yellow to ochre. The cap and stem flesh contain a high proportion of sphaerocysts, usually in clusters, that are the cause of brittleness of the fruitbodies; these are roundish cells unlike the tube-like structures found in more flexible fungi. The stems (stipes) are brittle and snap like school chalk. There is no stem ring and no basal volva. The Lactarius mushrooms are known as milkcaps because of the latex ('milk') that is exuded from their gills when they are cut or broken. Like the brittlegills, milkcaps are ectomycorrhizal fungi, and they live in symbiotic relationships with trees or shrubs. Illustrated here is the Oakbug Milkcap, Lactarius quietus, which is a very common mushroom found in oak woodland. The initial colour of the milk, its taste, and any colour change as the milk dries are valuable identification characters in a group with little cap colour variation. Russula fungi are sometimes referred to as russules rather than brittlegills, while milkcaps are sometimes referred to in older field guides as milk caps or milk-caps. Jacob Heilmann-Clausen, Annemieke Verbeken, & Jan Vesterholt., 1998. The Genus Lactarius (Fungi of Northern Europe - Volume 2); The Danish Mycological Society, ISBN 87-983581-4-6. Rayner, R W., 1970. Keys to the British Species of Russula (3rd Edition); British Mycological Siociety. Bon, M., 1988. Cle Monographique des Russules d'Europe. Doc. Mycol. 70-71:1-20 and Doc. Mycol. 32 (2002-03). Kibby, G., 2011. The Genus Russula in Great Britain, with synoptic keys to species. Publ. G. Kibby. Pat O'Reilly, 2011. Fascinated by Fungi, First Nature Books. ISBN 978-0-9560544-3-2.